I walked away from this meal, Leek-y Chicken and Couscous, feeling full and happy that I ate something healthy. In the magazine, she says this meal, like most of the meals in her new cookbook, "plays up one big flavor, so you won't need much from the store." If you have your Every Day Kitchen stocked up, all you would have to buy is couscous, chicken tenders, leeks and parsley. Even without having my Every Day Kitchen stocked, all I had to buy was leeks, parsley, and raisins. It was nice to be in and out of the store, so my first Express Lane Meals experience was a good one, even though I don't have the book yet (darn US postal service!). 1. Heat the chicken broth and the butter in a medium saucepan. (Use a pan with a tight-fitting lid.) When the broth boils, add the raisins and the couscous. Take the saucepan off the heat. Stir the couscous and place the lid on the pan. Let stand. 4. 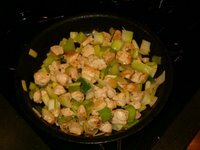 Stir the leeks into the chicken and wilt for 2 to 3 minutes. Add the wine and let it cook down by half, 3 to 4 minutes. 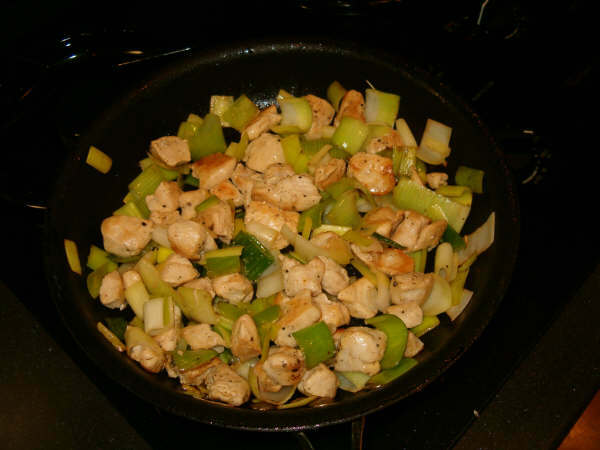 The leeks should be tender, with some bright green color, and the chicken should be cooked through. 5. Fluff the couscous with a fork and stir in the parsley. Spoon a bed of couscous onto dinner plates and top with the chicken and leeks.